A new kind of special-purpose bus will start touring the streets of Belgrade before the end of the year, providing help for the most vulnerable group of its residents – the homeless. EURACTIV Serbia reports. On the bus, they will be able to take a shower, get a haircut, use the toilet and have their laundry washed, but also get practical advice and other kinds of help. Funds for its work are being raised through a local crowdfunding campaign called Push the RoadHome. There are an estimated 3,000-5,000 homeless people living in the Serbian capital. The figure is believed to be even higher but the exact data is impossible to obtain, both because not all those living on the street can be reached and because the homeless often do not want to be ‘found’. The average homeless person in Belgrade is male, aged about 50, divorced, with a secondary school diploma. He has been on the street for more than nine years, has no access to health insurance and has very probably been attacked at least once. He also predominantly sleeps outdoors in the summer and in enclosed but inadequate spaces in the winter. There is no homeless shelter in Belgrade, except for the Shelter for Adult and Elderly Homeless Persons with a capacity of just over 100 people, which provides temporary accommodation for almost twice as many people in winter months. Representatives of the Adventist Development and Relief Agency (ADRA) Serbia, the organisation launching RoadHome, say that by introducing a mobile service for the homeless they wish to fill a gap that exists in Belgrade. RoadHome will offer homeless people direct support in the form of better hygiene conditions, which will help restore their dignity, self-respect and hope, as well as long-term support in the form of creating possibilities for these people to get back on their feet and re-enter society. The RoadHome project has sparked interest across Serbia because there are homeless people in nearly every city and town of the country of seven million people, but ADRA has also been contacted by certain officials from Skopje, Macedonia. The overall number of homeless people in Belgrade includes the so-called primary and secondary homeless, i.e. those who live outdoors and those who live in structures lacking basic living conditions, ADRA Serbia Director Igor Mitrović told EURACTIV Serbia. According to him, that division should be replaced by a more adequate one, such as the European Typology of Homelessness and housing exclusion (ETHOS), which lists seven categories of people living in a situation of homelessness, based on the fundamental human right to housing, which is precisely that – a right, not a privilege. The ADRA director believes that solving the homelessness problem in Serbia and the region requires progress in three areas: The highest legal acts need to be adequate for solving the cause of homelessness, the system must be ‘recalibrated’ so that this issue is solved in the long term, and a culture of solidarity among the general public needs to be developed and strengthened. 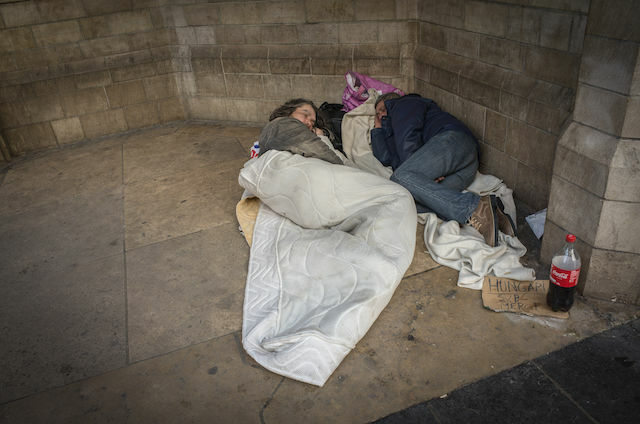 Even the wealthier and more developed European countries are not immune to the issue of homelessness. According to the latest FEANTSA survey for 2018, of close to 300 million households in the EU, 11% barely make ends meet, close to 9% have trouble maintaining appropriate room temperature in their home, more than 15% live in damp spaces, and 3.5% are behind on their lease or mortgage payments. For the same reasons as in Belgrade and elsewhere in the world, the number of homeless people in the EU is unknown. FEANTSA also announced that over the last few years, only two European countries have managed to reduce the number of homeless persons – Finland and Norway. In Finland, the number of the homeless was reduced by 10% between 2013 and 2016, while in Norway it was reduced by 36% between 2012 and 2016. The Push the RoadHome crowdfunding campaign for support to the RoadHome project (https://igg.me/at/drumodom) will last until 13 December, and its goal is to raise €12,200 so that the mobile service for the homeless may operate smoothly throughout 2019. These guys are really good in Emini S&P trading, Google “Emini S&P Trading Secret” .